Among the terrestrial impact structures Azuara (together with the same-aged Rubielos de la Cérida impact basin) is exceptional in respect of many features. Apart from the excellent outcrop conditions and the easy access the thick (up to 10 km) purely sedimentary target with a large lithological diversity has provided a host of highlighting and educationally important geological observations which in general are not obvious in impact structures with a crystalline target. The visitor of our web pages will be confronted with a host of such peculiarities; here we are presenting a little foretaste only. Fig. 1. Reddish breccia dike (hammer for scale) cutting through polymictic breccia. Azuara structure, between Plenas and Loscos villages. Obviously, the dike was emplaced after or during the deposition of the breccia. An intrusion from below is suggested. Detail in Fig. 2. Fig. 2. 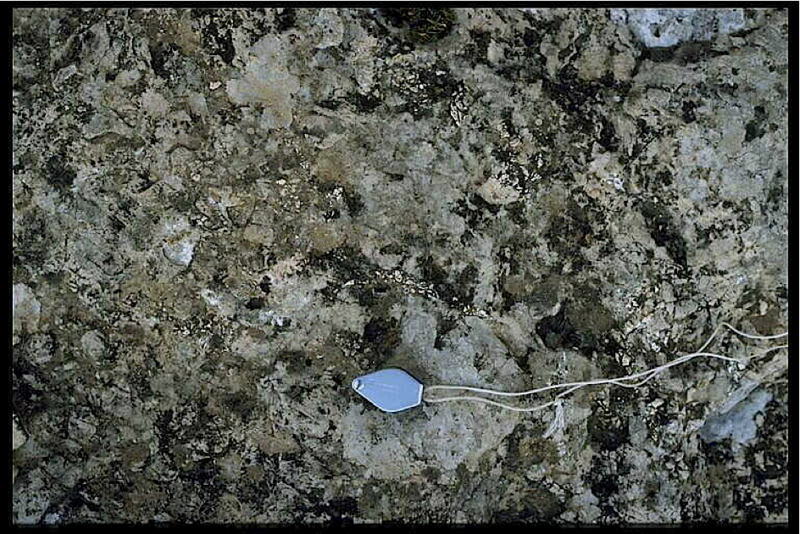 Detail of the breccia dike in Fig. 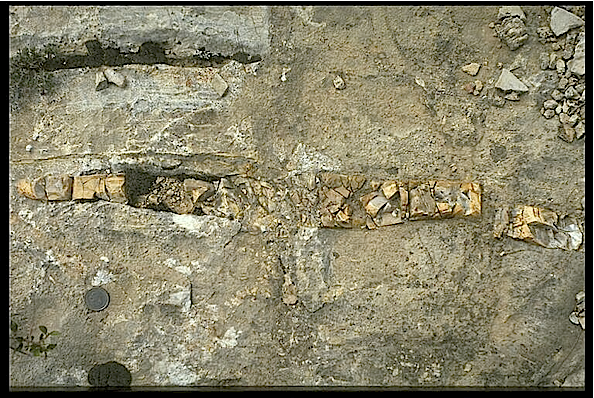 1 showing pipes (arrows) within the dike which may be degassing pipes. Fig. 3. Plastically strongly deformed Dogger/Malmian limestone slabs in a polymictic breccia dike near Muniesa. An excellent and detailed description of this prominent 300 m- length breccia dike is given in G. Mayer’s Diploma thesis (1990). Fig. 4. Breccia dikes penetrating a chert nodule in Liassic limestone. Lots of chert splinters have been dragged along from the shattered nodule. Coin diameter 23 mm. Ring wall near Belchite, Azuara impact structure. Figs. 5, 6. Impact-induced flow processes (shock fluidization) in Muschelkalk limestones traced by chert splinters from crushed chert nodules. Fig. 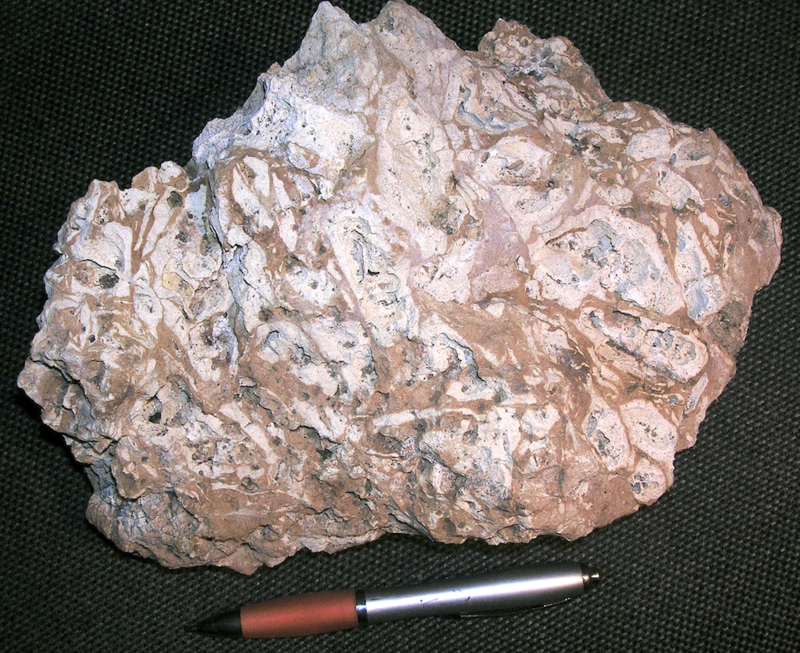 5: Heavily crushed and disintegrated chert nodule in Muschelkalk limestone at Monforte de Moyuela, Azuara impact structure. Fig. 7. Azuara impact structure. 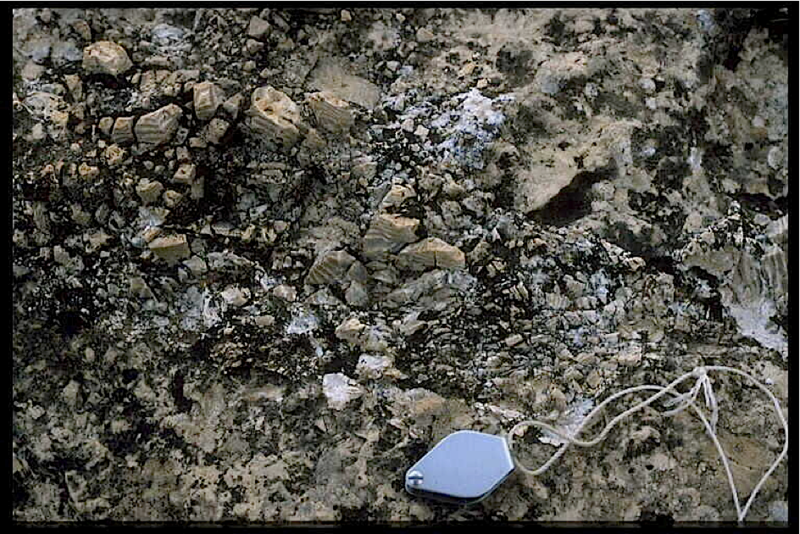 This breccia is exposed near Almonacid de la Cuba at the NE rim of the structure and is so far unique with respect to composition and texture. Within a dense to porous and even foamy grayish carbonate matrix, components of snow-white color are embedded, which are in most cases extremely vesicular as shown in the photograph. 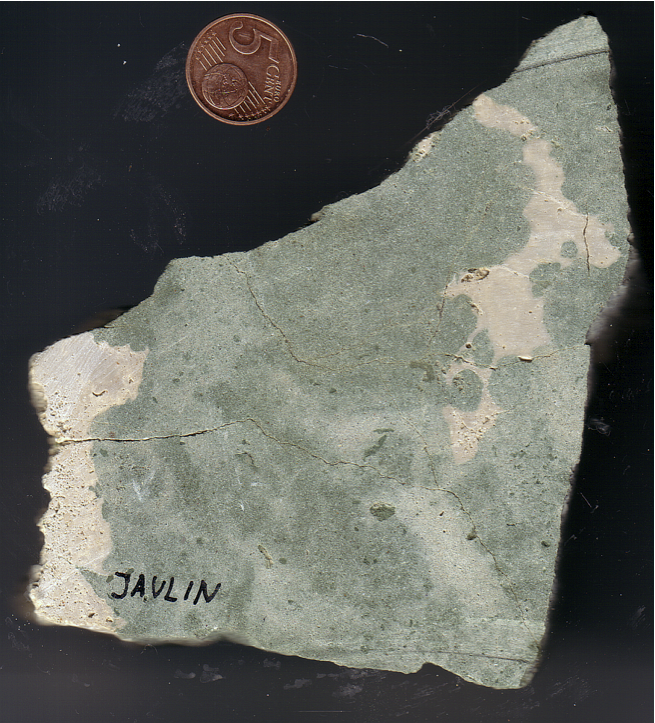 The breccia is part of an extended deposit, which has in detail been investigated by Tanja Katschorek (diploma thesis). From field work and petrographic analyses, she concludes that the deposit has resulted from an expanded, turbulent, and dilute flow by inclusion of carbonate melt, similar to volcanic surges. Field width c. 20 cm. Fig. 9. Another aspect of the Jaulín impact breccia suggesting some affinity to the Almonacid de la Cuba impactite in Fig. 7. Compared with the sample in Fig. 8, the intimate mixing of the green sandstone and the pale limestone material is even more pronounced. Jaulín samples courtesy of P. Bockstaller. Fig. 10. 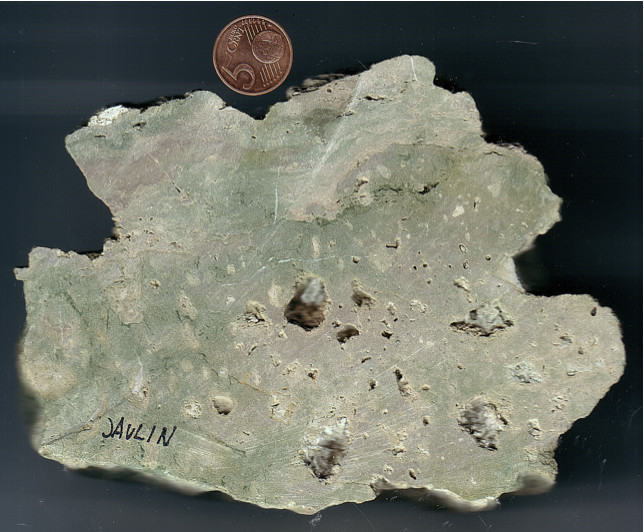 A more clast-dominated impact breccia exposed in the Jaulín outcrops is shown here. 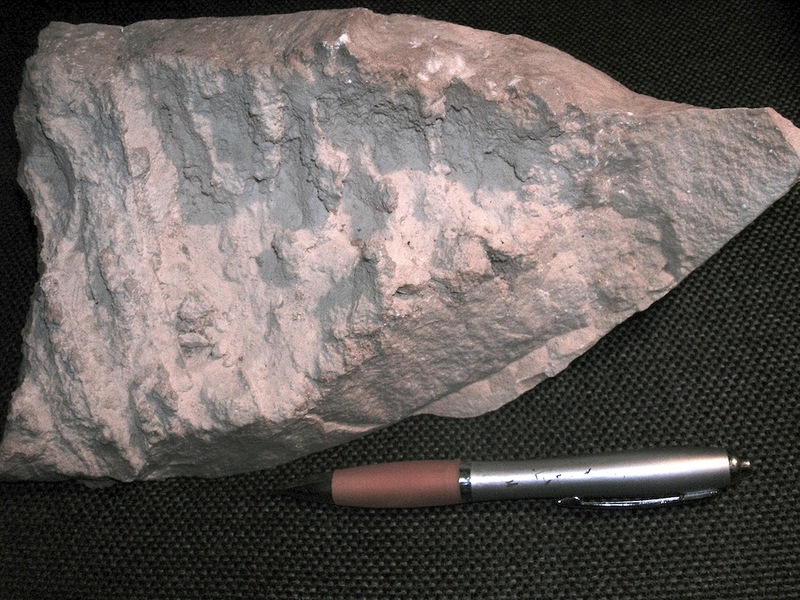 A brownish carbonate matrix contains abundant sharp-edged Jurassic limestone clasts. Details in close-up in Fig. 11. Fig. 11. A close-up of the Jaulín impact breccia shows two remarkable aspects. 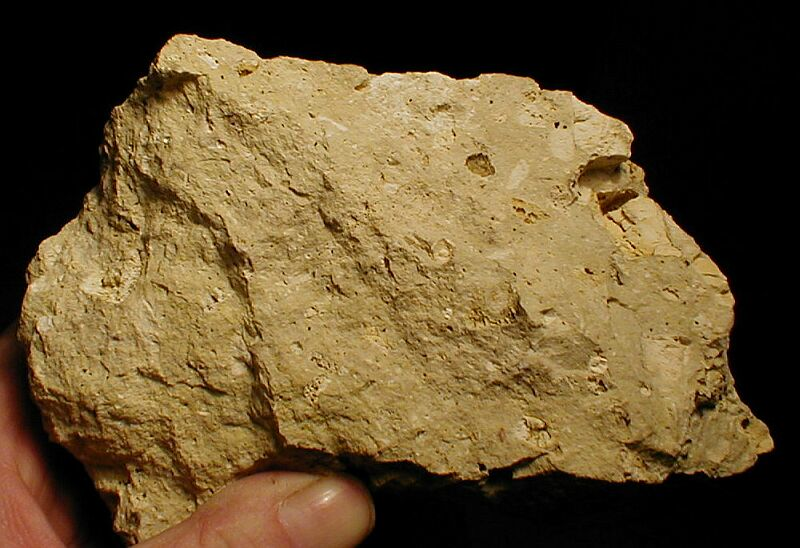 The larger limestone clasts are deeply corroded, but the corrosion is limited to the interior of the components. 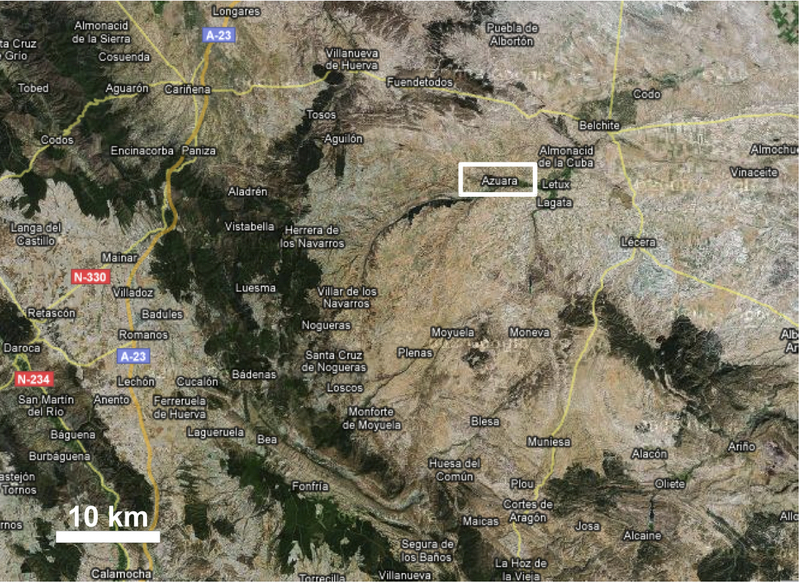 This is an observation frequently made in various outcrops of the Azuara and Rubielos de la Cérida impact structures. 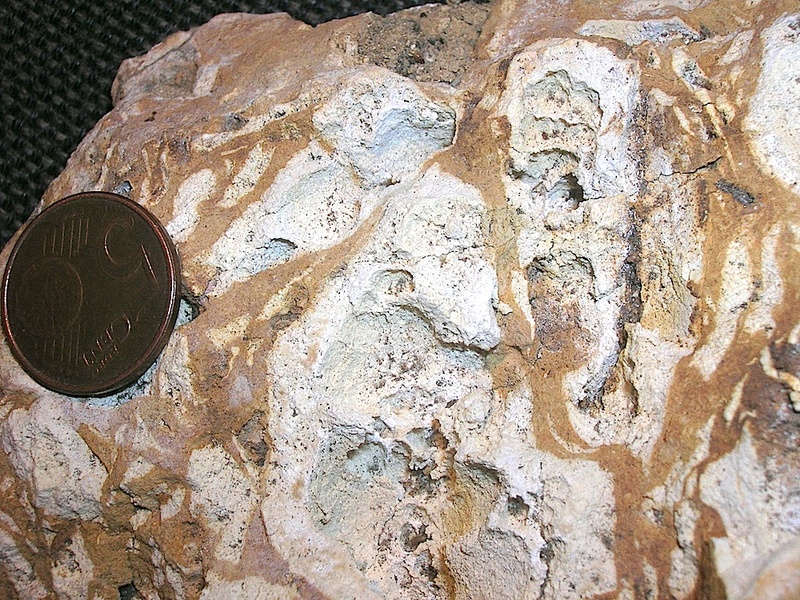 The internal corrosion of carbonate clasts is interpreted to be the result of a shock focusing and energy concentration leading to interior temperature increase with decarbonization and/or carbonate melting. A more rapid cooling of the outer shell and a longer preservation of high temperatures in the interior of the clasts may have contributed to this peculiar texture. A comparable phenomenon is shown in the figures below. – The second observation concerns the smaller limestone splinters that are in part plastically deformed and are adjusted in a matrix flow around the larger clasts. Fig. 12. Diamictite deposit near Villar de los Navarros (click the map) containing internally heavily corroded carbonate cobbles and boulders. 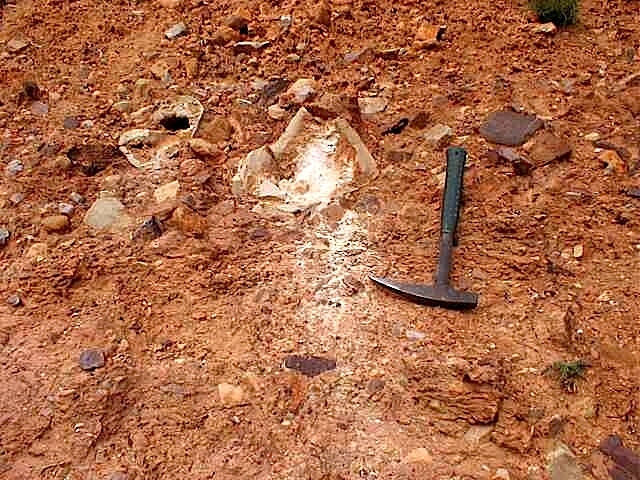 Details of the clast with the white outflow in Fig. 13. Fig. 13. Part of the fractured clast from Fig. 12. The white powder is the relic of the internal shock-induced decarbonization and/or carbonate melting. Under the microscope the majority of the powder consists of tiny dolomite crystals that obviously were more resistant to the carbonate high-temperature disintegration. Fig. 14. 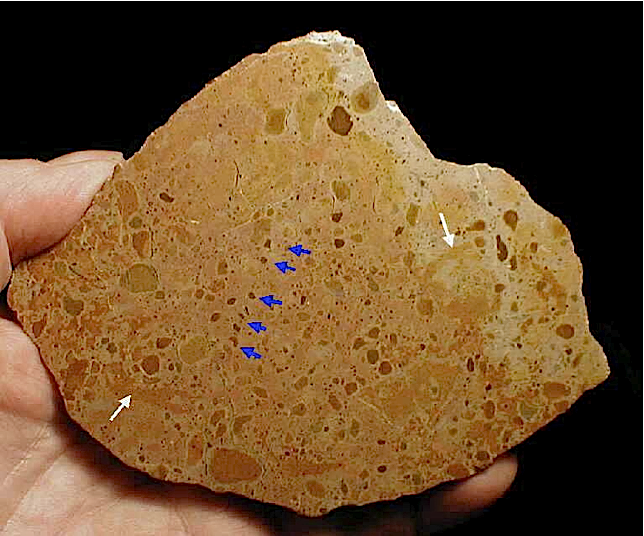 Azuara impact structure: Polymict globular “breccia”. This rock is a breccia in a broad sense only. The globular components turn out to be glomerations of smaller globular fragments, and the matrix itself is also composed of globules down to microscopic size. 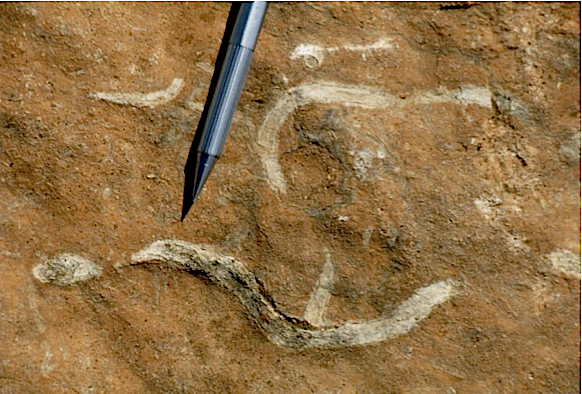 The texture of the rock shows intriguing features such as distinct strings (blue arrows) and whirls (white arrows). Therefore, soil formation (e.g., caliche) can be excluded. Instead, we suggest the rock to be an impactite and the globules to have grown by addition of finely dispersed material in an explosion cloud and, such, to form accretionary lapilli (Graup, 1981, in a paper about the suevite of the Ries impact structure).